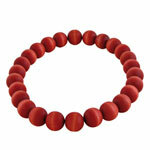 Turn up the heat this July with this bright red 'Pohjola' wooden bracelet. The simple design and vibrant colour make this designer wooden bracelet a versatile piece of jewellery for summer. With its fuss-free design, the red bracelet looks great day or night. Wearing jeans and a simple top? This bracelet is perfect for casual chic. Going on holiday? 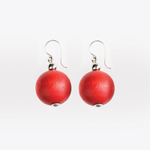 The red bracelet offers simple, feminine style and is light to carry and wear. Or off to a summer wedding? This wooden bracelet will add natural glamour and brighten darker outfits. Beautifully crafted from sustainable birch wood, the wooden pearls of this bracelet are silky to the touch and stained a vibrant red. 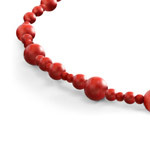 You can wear this red bracelet on its own to add a bright splash of colour to your look, or team it up with a similar necklace or earrings for increased impact.